What makes Christmas special to you? Here some of our team have shared what Christmas means to them and what their family and Christmas traditions are. Christmas has really changed for me since I was a child, so few traditions survive in truth. In general I always leave the shores to escape the chaos and mayhem but there are still a few things I would consider essential. Even if I am in sunny Australia with the family. Having a French Mother, an American Father and an English wife means that my “traditional” Christmas food is a truly international affair. The one tradition that is my own, which I always insist on, is Belgian waffles and Bucks Fizz for breakfast Christmas morning. After that, it’s out of my hands. In the time-honoured French tradition, we always have a seafood feast on Christmas Eve. Lobster and oysters are a must, supplemented with whatever else looks good at Billingsgate market that morning. Christmas Day’s festive fayre will be dictated by whether I’m celebrating with my wife’s family or mine, which we alternate every year. With the in-laws, it’s traditional English Turkey with all the trimmings. With my parents, we either have leg of lamb or roast rib of beef. Boxing Day, which is a new tradition for me, we have leftovers, complimented by honey roast ham, pickles and cheeses. Needless to say, everything is washed down with far too much beer, wine, eggnog, snowballs, Baileys, brandy and pretty much any other alcoholic beverage you could think of. I think I’m ready for a nap just thinking about it all! For me, Christmas is all about spending time with family and friends and I absolutely love hosting it. Serving great food and wine in the comfort of your own home is the real essence of hospitality. To avoid the stress, I do everything I can in the kitchen to make my life as easy as possible. No, that doesn’t mean taking shortcuts, it’s just about being organised and delegating where you can. 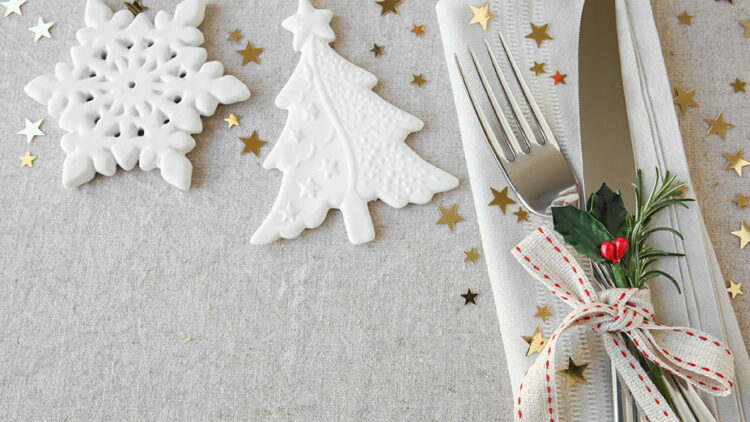 Pete Redman’s recent Christmas Dinner Countdown Time Plan gives you some great pointers on how you can get ahead before the big day. I’m not shy in asking our guests to bring round some prep – peeled veg, desserts or a nice cheese board. Anything to take the pressure off you, so you can enjoy the day as well. My sister is over from Aus this year so we’re doing everything as traditionally as possible, which I love. That said, turkey isn’t my preference but I lost the battle this year. Beef on Boxing Day as a compromise! Here’s to a very Merry Christmas and a prosperous New Year. I’m looking forward to a Christmas Break. It’s been a busy year and I’m having a family time over the holiday period this year for a change. Christmas Eve is always a get together with a sing song with our theatrical (AmDram) friends to enjoy a glass or 10 around the piano at our house!! The evening winds up around midnight and it’s off to bed ready for an action packed Christmas Day. I’m up and straight on with preparing the lunch. We eat at around 2pm so the turkey needs to be in the oven by 09.00 and I have to make the stuffing before the bird goes in. Then it’s veg prep and a large pile of peeled potatoes for roasties. At 11am it’s time for the first drink of the day – Champagne. We’re going for the retro Prawn Cocktail (one of my classic favs) this year accompanied by a glass of Gewürztraminer. For pud it’s always the traditional Christmas one (confession time – it’s not homemade) supported by a glass of my favourite dessert wine Torres Floralis Moscatel. Cheese will follow, but a lot later. A well ripened Camembert and a chunk of Tickler cheddar with grapes. In between pudding and cheese we’ll play a few silly games such as, Who Am I and Trivial Pursuits to name but a few. After that it’s time for a snooze and relax before we start again with the Boxing day schedule. I then love to start all the cooking for home – with Jamie’s Christmas Pudding from his Nan’s recipe and mince pies, and of course you couldn’t do Christmas without Nigella. My husband loves her chilli jam, chutney and flavoured vodka…Well it is a time to spoil yourself and the ones we love! All of this in between work of course, our busiest time of the year, Christmas lunches, fayres and events. But all served with a smile from our fabulous teams. Then it’s looking forward to a few days off with friends, family and of course fizz! When I think about what is traditional in our house at Christmas I doubt if mine would be much different than anybody else. Turkey dinner, presents under the tree, putting mince pies and beer out for Father Christmas and a carrot for Rudolph, of course. But when I was younger what really signalled the start of Christmas for me was watching the film The Wizard of Oz, this for me always meant Christmas was here. I remember scouring the Radio and TV times (showing my age now) looking for the day that it would be on and then counting the days down in anticipation. I can remember everything about the film. Judy Garland as Dorothy, Scarecrow, Tin Man and of course the Cowardly Lion. But what stuck with me most was I could only remember the film being on at Christmas. Nowadays, my two sons and I love watching Home Alone, another Christmas classic, but like every other chef we work hard all year long so there is nothing better than us all being together at Christmas making memories that will stay with us always.